Sebastian - Saatchi Prize Shortlisted and RISD Scholarship! How lucky I am, that in my twelve years in this profession, I have spent four of them teaching Sebastian. I use the term “teaching” loosely, as since Year 10 he has required very little teaching; merely guidance, coaching and an occasional reminder of the deadlines. He is truly one of the most talented students that I have ever taught. 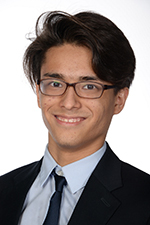 Therefore, it was no surprise that Sebastian was not only successful in his application to the Rhode Island School of Design, but has also received a scholarship. A very fortuitous and extraordinary achievement. In his final weeks at Dulwich College Shanghai, he has continued to amaze us as we now hear the news that he has been shortlisted for the Saatchi Gallery Art Prize for Schools. The Saatchi Art Prize is a very prestigious art competition that attracts thousands of entries every year. This year, Dulwich College Shanghai entered 43 Senior School art students. From the 24,000 entries, just 20 artists were shortlisted, including our very own Sebastian. His photograph entitled The Last Lesson, is a satirical remake of Da Vinci’s The Last Supper. The artwork perfectly encapsulates who Sebastian is as an artist and observer of the world. As a draftsman, his drawings are exceptional however, over the last two years Sebastian has often turned his back on his traditional fine art talents to pursue much riskier and challenging methods and pathways. Highly competent in both digital and hand-made media, his outcomes always offer an intelligent and often witty narrative. This is also a reflection of Sebastian’s character. An unassuming student, it is easy to mistake his calm and reflective nature for shyness. However, upon engaging in conversations about his work, it is clear that he has a lot of confidence and charisma. As Sebastian prepares for undergraduate study, we have had the opportunity to reflect on his artistic journey. From incredibly accurate and refined drawings to humorous story-telling, Sebastian will certainly leave a legacy in the Art Department at Dulwich College Shanghai. For many of the faculty, he will be remembered as the student that miraculously organized thirteen teachers to sit perfectly still for fifteen minutes on a busy Friday afternoon, whilst he arranged the remarkably accurate reenactment of the Da Vinci classic. As teachers that know him, we posed without question. Despite the satirical undertones regarding hierarchy and power, we completely trusted Sebastian. Little did we know that the photograph would end up being such an important moment in Sebastian’s artistic career. I have no doubt that he will continue to make significant and important contributions throughout his studies at RISD and into his career. The exhibition of the 20 shortlisted works will take place 4th-13th July 2017 at the Saatchi Gallery, London. The winner and runner up prizes will be announced on the 4th July at an awards evening. We offer Sebastian our warmest congratulations in all that he has achieved so far, and the very best of luck in his future endeavors!